What else does drummer Jason Marsalis play? Vibes, and quite well. Listeners often think of Jason Marsalis first as Wynton Marsalis’ younger brother and second as a New Orleans drummer. But like his siblings – including saxophonist Branford and trombonist Delfeayo – Jason stands as a first-rate musician-bandleader in his own right. 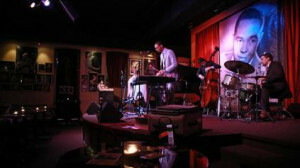 He also happens to be a fine vibraphonist, as he reaffirmed Thursday night at the Jazz Showcase. Leading the Jason Marsalis Vibes Quartet, he delivered original compositions and standards with elegance and grace, evoking a legendary ensemble that’s clearly a model for him: the Modern Jazz Quartet. Nowhere were the parallels between the two units more apparent than in Marsalis’ “Characters,” from his “In a World of Mallets” album of 2013. For starters, the piece unfolded gently, at a relaxed tempo and with an easy but imperturbable sense of swing one associates with the MJQ. Drummer Dave Potter’s deft brushwork brought a nocturnal atmosphere to the proceedings, while Marsalis’ sinuous melodic lines and ultra-sophisticated chord progressions attested to his skills as composer. In many ways, Marsalis’ “Characters” showed the influence of ballads by MJQ pianist John Lewis, but with an unpredictability of line that proved to be a Marsalis signature throughout this performance. 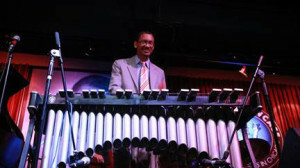 The vibraphonist’s phrase-making was decidedly more animated in “The 18th Letter of Silence,” from Marsalis’ newly released album, “The 21st Century Trad Band.” Like most of Marsalis’ compositions, this piece bristled with melodic invention, the vibraphonist emphasizing linear playing, sharp instrumental attacks and irrepressible rhythmic urgency. Pianist Austin Johnson, bassist Will Goble and drummer Potter stayed with the leader in some of the most hard-driving music of this set. “Blues Can Be Abstract, Too” crystallized Marsalis’ views on tradition and innovation, the vibraphonist drawing upon blues conventions but updating them with idiosyncratic turns of phrase and a complex overall structure. Here was the Marsalis Vibes Quartet at its most tautly controlled, the vibist presiding over a meticulously conceived arrangement in which each musician’s contributions emerged right on cue. But no two pieces in this set conveyed the same sensibility, which underscored the many musical curiosities that drive Marsalis’ work. In his “Ballet Class,” the formalities and harmonies of classical music dovetailed with nascent ragtime rhythm. Jason Weaver’s “Blues for Now,” from “The 21st Century Trad Band” album, inspired Marsalis to take an orchestral approach to his instrument, the vibraphonist carefully layering themes and colors through the course of the work. Some of the most ethereally beautifully music of the evening emerged in “Love Always Comes as a Surprise,” which originated in – of all places – the film “Madagascar 3.” Marsalis produced florid improvisation here, developing the tune’s underlying harmonies in softly shimmering tones. There were standards, too, Marsalis letting “I’m Confessin’ (That I Love You)” speak sweetly for itself, the tune slightly embellished but delivered without pretense. When it came to an uptempo version of “You and the Night and the Music,” however, Marsalis took flight, his brisk tempo setting the stage for deep swing rhythm and intelligent transformation. In none of this music, however, was instrumental virtuosity presented as a goal. So though there’s no shortage of jazz vibraphonists who show more technical wizardry (Stefon Harris) or innovative audacity (Jason Adasiewicz), the musicianship, seriousness and tonal beauty of Marsalis’ art were unmistakable. To him, it’s all about the music, not the musician, a point he reiterated in his arrangement of Cliff Hines’ “Interzone,” with its gripping repeated-note theme and his four-mallet chordal voicings. By the end of the set, Marsalis had covered more musical facets, forms and expressions than one typically encounters in a single evening, and it’s a good bet there’s more where that came from. This entry was posted in Press, Reviews and tagged Austin Johnson, Blues Can Be Abstract Too, Characters, Chicago Tribune, Dave Potter, In a World of Mallets, Jason Marsalis Quartet, Jazz Showcase, John J Kim, Modern Jazz Quartet, The 18th Letter of Silence, The 21st Century Trad Band, vibes, vibraphonist on November 24, 2014 by abell.